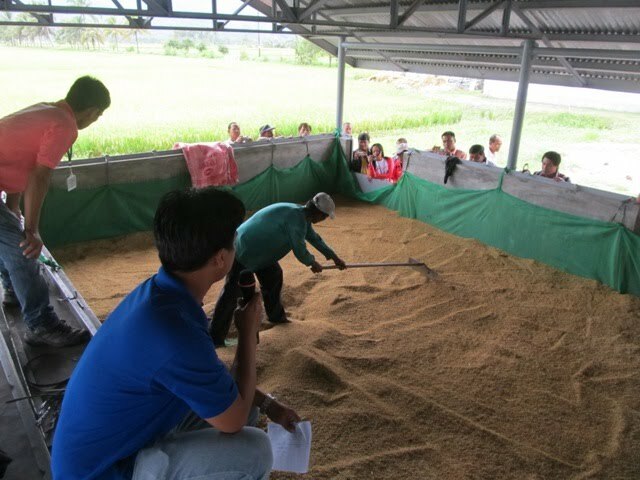 The Postharvest Learning Alliance (LA) members in Butuan, Agusan del Norte met and conducted more activities in time for the town's harvesting season. Typhoon Ramon left the participants unfazed as about 40 people signed up for the Training on Reversible Airflow Flatbed Dryers and Hermetic Storage Systems in PhilRice RTR, Agusan del Norte last October 11 and 12. The project team from IRRI and PhilRice took turns to orient the Agricultural Extension Workers (AEWs), farmer-leaders, and farmers' group cooperative members about the latest postharvest initiatives in the Philippines. Farmer participants lauded this effort wherein these new technologies can benefit big and small holder farmers in Agusan. Shortly after the training, the LA technical working group (TWG) held its quarterly meeting at Amontay Beach Resort, Nasipit, Agusan del Norte last October 13, 2011. Partners who attend this meeting are those who have direct interest on hermetic storage. Rica Flor, the Project’s impact specialist facilitated the discussion between PhilRice, GrainPro, IRRI, DA-RFU, Caraga State University and Santo Niño Multipurpose Cooperative (SNMPC). Case study write-up, including trial protocols and data collection tools was introduced. One of the outputs of this meeting was a draft business case study for Super bags and cocoons which successfully demonstrated an increase in profit of a farmer-user. The last activity was the Video Production Training for Learning Alliance Partners which was held on October 14. For this activity, project communication specialists Trina Mendoza and Reianne Quilloy took turns into facilitating the session with 40 information officers and staff from the CARAGA Region, Davao City, and DA- RFU 13. Reianne presented the importance of making videos and basic information, while Trina presented the basic principles of scriptwriting and Digital Green. In the afternoon, the participants conducted a hands-on exercise in Digital Green. The participants were able to successfully follow the process of creating storyboards and produced short edited videos that showcased their creativity, innovativeness, and sense of humor. Ms. Rebecca Atega of DA-RFU 13 and one of the learning alliance partners in Agusan, took the initiative to organize the three activities. The efforts are part of the outputs of the ADB-IRRI Posthavest project to address the postharvest challenges in Asia, including the Philippines. More learning alliance activities are expected to pour into the CARAGA region, as the project’s efforts in reducing postharvest losses through technology innovations, best management practices, and intensive information dissemination are slowly coming to fruition.